MORMONS are outing themselves. In 2010 the Church of Jesus Christ of Latter-day Saints launched a multi-million-dollar campaign to counter misconceptions about the religion, and last October it was vastly expanded. Billboards have now gone up in a dozen American cities, featuring real members. I’m a Mormon, say lawyers, scientists and surfers, smilingly directing viewers to the church website. There the curious can chat with a missionary, or browse some 80,000 profiles to find Mormons who are like them.Over the past year, according to the church, people have initiated about 1m chats via the site, often asking about the Mormon record on gay rights, or other controversial things. And since the launch of the October campaign there have been 30,000 more Mormon profiles to look at. Some might think this unnecessary. In 2010 the church added some 400,000 converts and babies, pushing worldwide membership above 14m. 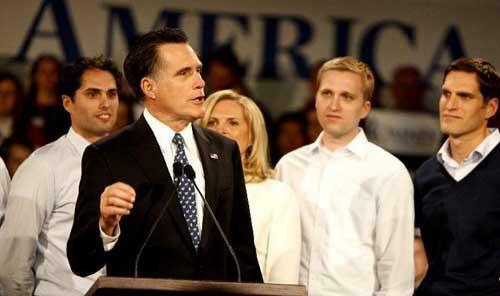 If Mitt Romney wins the Republican nomination, there may be a Mormon president soon enough. In a January poll of Mormons from the Pew Forum on Religion & Public Life, 63% reckoned that acceptance of their religion is rising. 有些人认为这样的做法是不必要的。2010年时，有40万名皈依者与新生儿加入了摩门教会，此后全球的摩门教成员超过了1千4百万。如果米特•罗姆尼获得了共和党提名候选人提名，也许很快美国就要出现一位摩门教总统了。一月份皮尤宗教与生活论坛显示，63%投票的摩门教徒认为他们信仰的宗教正获得越来越多人的认可。Still, Mormonism has some way to go. The complaints against the religion are familiar. It is a young religion, and it strikes many people as weird. Its greatest breaks with mainstream society, such as polygamy, are in the past, but the church still stumbles into the occasional controversy, most recently over its opposition to gay marriage. Mainstream Christians are particularly sceptical: millions dispute that Mormons are Christians at all. The church’s professions of normalcy, like Mr Romney’s, apparently irritate some people, but the suspicions must soften at some point. Matthew Bowman, the author of a new history of the religion (and a Mormon himself), reflects that this is actually the fifth or sixth Mormon Moment since 1902, when the Senate spent several years arguing over whether to unseat Reed Smoot, an apostle from Utah. Each time, he says, the same barbs reappear. There may be a cautionary tale there. Today Smoot is remembered for his support for tariffs rather than his religion. In any case, the church’s campaign could help. It confirms the impression that Mormons are nice, and makes thoughtful use of the web by asking members to post their own responses to frequently asked questions. Over time, however, Mormons will probably gain acceptance through growth as much as the other way around; a bigger church must have a bigger tent. That adds a twist to Mr Romney’s saga. Throughout his career, people have wondered if his religion will hurt his chances; polls show that about a quarter of Americans are wary of voting for a Mormon. But some people dislike Mr Romney for other reasons, and may judge his religion accordingly. If a church is trying to make friends, having any politician as its most prominent member may be a mixed blessing.